Shopping for Star Wars Playsets? The biggest Star Wars playset in over a decade! The 3 3/4-inch scale The Last Jedi playset of your dreams is here! Giant 24-inch tall BB-8 features lights and sounds, and the action figures speak. Includes exclusive Snoke and Praetorian Guard action figures! There's a throne, collapsing bridges and walkways, and tons of pegs for figures. 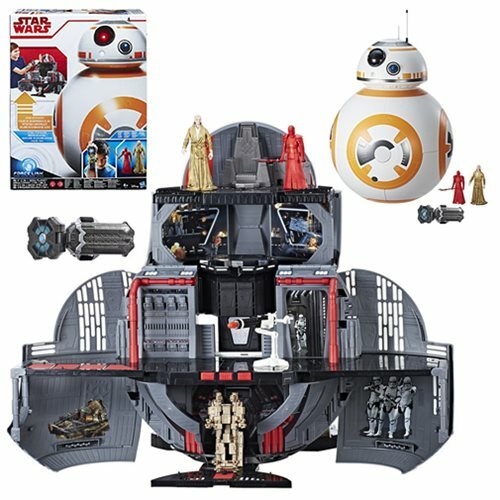 The 3 3/4-inch scale playset of your dreams is here with the Star Wars: The Last Jedi BB-8 2-In-1 Mega Playset with Force Link and Action Figures. The giant BB-8 figure has its own lights and sounds, but it also carries a secret - there's a First Order base inside! With a few flicks and turns, you can open the droid to reveal a playset that measures just under 24-inches tall. There's a throne, collapsing bridges and walkways, and tons of pegs to position your Star Wars action figures… like the included exclusive Snoke and Praetorian Guard action figures. A Force Link band is included for even more fun. Wear it to make the playset and your The Last Jedi 3 3/4-inch action figures speak! Don't wait on this one. This is the biggest Star Wars playset in over a decade!